Improve IT efficiency and reduce costs by automatically discovering physical and virtual servers, applications, and network devices—and their interdependencies—BMC Discovery (formerly Atrium Discovery & Dependency Mapping) provides vital information for IT projects like virtualisation and cloud planning, asset management, data centre standardisation and compliance, business continuity, and change impact analysis. This, in combination with features like data provenance, preconfigured dashboards and reports, and an easy, Google-like search, translates into significant cost reductions, increased IT staff productivity, opportunities for IT optimisation, and a clear picture of how your IT infrastructure supports business services. 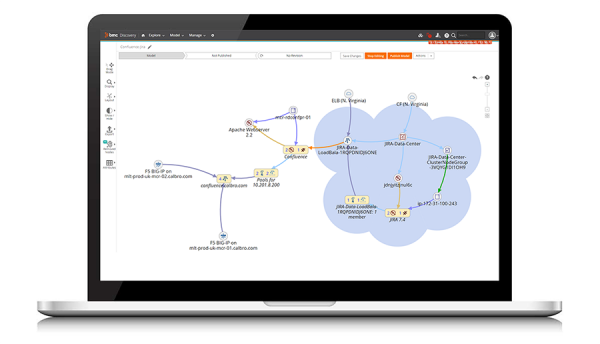 And, because BMC Discovery is built on the BMC Atrium architecture, it integrates seamlessly with BMC Atrium CMDB and key IT service management systems. Which all means you can establish a solid foundation for Business Service Management success. When you think of the application mapping process, “fast” and “easy” usually aren’t words that come to mind. That’s where collaborative application mapping can help. With just a small amount of basic information from application owners, you’ll be able to plug this data into BMC Atrium Discovery’s advanced UI to quickly map applications. The resulting application map is automatically updated when changes occur in the IT environment. For BMC Discovery, usability is the name of the game. Installed as a virtual appliance—with agentless discovery, fast and easy deployment, minimal administration, and broad coverage of all operating systems and virtual platforms—BMC Discovery delivers out-of-the-box data centre discovery in just hours.